Drained from his battle with the Trackers, Havok escapes from the Cult of the Living Pharaoah. Days later, just as Leila was hunted down, the Cult has now come after Havok. But, this time, Wolverine has found him, too, and joins the fight to protect his fellow X-Man. The Black Panther sits on a hillside and reflects upon the past few days as he has had plenty of trials in his search for his mother. Zanti Chikane breaks him from his daydreaming to remind him of his appointment to meet with the informant, Patrick Slade. But when the meeting takes place, it’s ambushed by a murderous soldier! Freed of his internal blocks, Coldblood-7 takes his car barrelling through the wall, that was previously unbreachable, and outside the city! He finds himself in a desert, and the city that he had come to know was only a mock-up of a small portion of Manhattan. Now that the target has escape the maze, Mako has sent his forces to kill Coldblood – no restraint necessary. Meanwhile, the cyborg has found his way to Las Vegas, Nevada. The assassin-bot disptached by Mako leads Coldblood on a deadly chase through the city of sin! An energy disturbance in Florida leads Quasar to Jennifer Kale and a sickly looking Man-Thing. The young woman asks for the cosmic hero’s help to save the guardian of the Nexus of Realities. It seems the swamp creature has been infected by a strange, black goop that has infected it and continued to grow inside its body. Quasar preforms a “c-section” on the pregnant-looking Man-Thing to release him from what is growing inside. Once the operation is done, a fully-grown man is released from the Man-Thing’s body. The man inside, Quagmire, seems to have villainous intentions and launches an attack on Quasar and Kale. After knocking the villain out, Kale reveals that Quagmire is from the Squadron Supreme of an alternate Earth and Quasar hauls him off (presumably to the Vault). Although it doesn’t plug the ongoing series that was released the very same month, this issue’s Quasar short was a prequel to his title. It’s even by the same writer and artist. And, it’s neat to see that the writer utilized another of his creations, Quagmire of the Squadron Supreme. 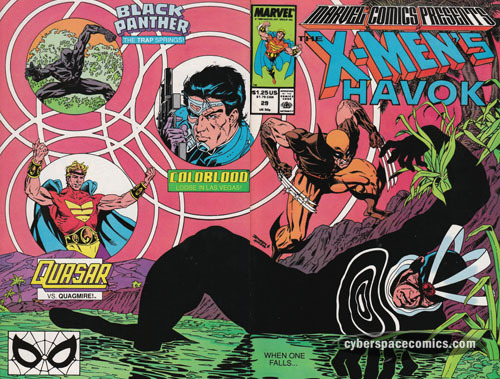 As for the Havok featured, I’m a litle disappointed to find that either the writer or Marvel didn’t have enough faith in him to hold down his own feature. Nope. They had to go and bring Wolverine in. Although, to be fair, there is some basis for a Wolverine/Havok team-up story since their Meltdown series was published in the previous year. 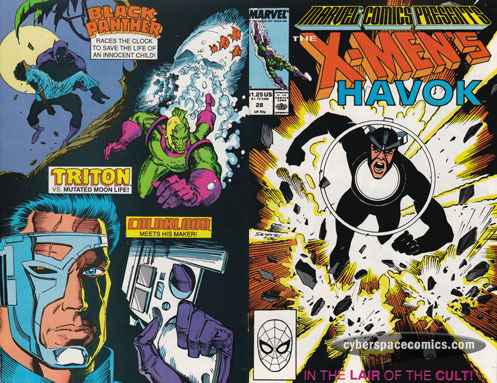 Dave Cockrum was the artist on the now-famous “all-new, all-different” version of the X-Men that featured a new group of international mutants including Wolverine, Nightcrawler, and Storm. His first run as artist lasted for about a year until he was replaced by John Byrne in 1977. Cockrum returned to the title for another run in 1981. After about a year and a half, Cockrum resigned from the X-Job to create his own group of super-heroes: the Futurians. 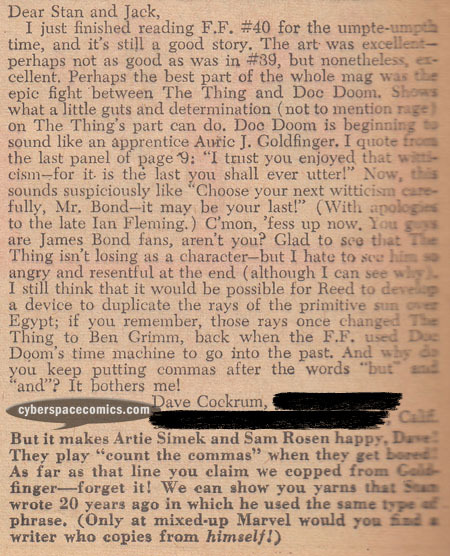 His letter, from Fantastic Four #44 (cover date – November 1965), accuses Stan Lee of ripping off lines from Ian Fleming’s James Bond series. 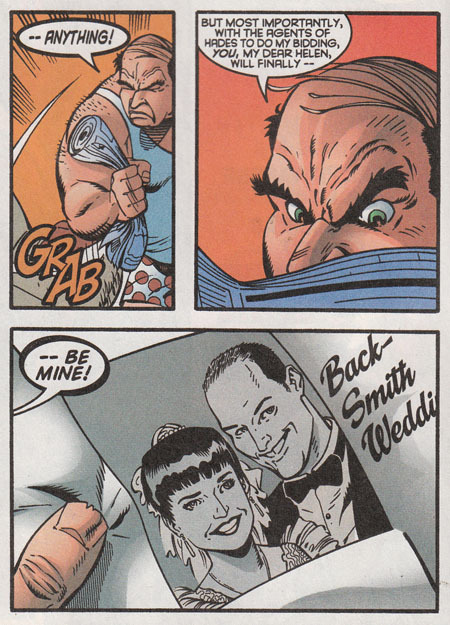 The villain in X-Men Unlimited #21 wants to win the love of Helen … too for him, she’s marrying Andy Smith. Wait a minute! This issue’s artist just happens to be Andy Smith, himself. Anyway, Andy (and his bride) go on to play minor roles in this issue. Fortunately for them, Strong Guy, Multiple Man and Wolfsbane come to their rescue. 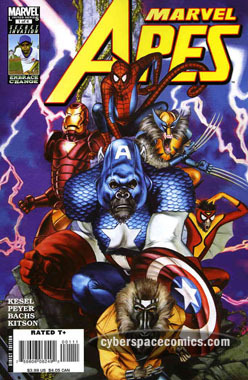 Marvel Apes kicked off the series with a nod towards the David Finch variant of New Avengers. In an attempt to further cull the strong from the weak, Apocalypse has devised a plan to set all of humanity against the Deviants. To advance his plan, he’s captured the Deviant mutate, Karkas, and mutated him further into a Godzilla-sized, mindless, rampaging monster! Meanwhile, in Olympia, an Eternal has been brought back from the dead – Virako, Ikaris’ father. 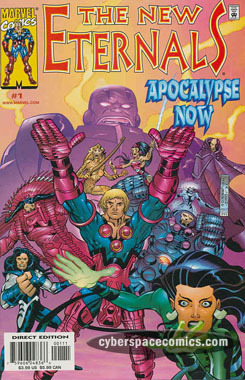 We’re also introduced to several, previously unseen Eternals including Suyin King, Ceyote, Aurelle, and Psykos. In order to save the planet from being ravaged by a deadly inter-species war, the Eternals have to take down their mutated friend, Karkas! And, once the threat has been neutralized, instead of revealing the nature of their species to the humans, they announce themselves as a new group of super-heroes called the New Breed. Complete with costumes and new codenames for them all: Sovereign (Ikaris), Corona (Thena), Ceasefire (Phastos), Tomorrow Hawk (Ceyote), Psyche (Psykos), Sparx (Aurelle), Chi Demon (King), Warhead (Ransak the Reject), and Mesmer (Sersi). Initially, I was excited about this story. A battle brewing between Apocalypse and the Eternals? Sign me up! Unfortunately, we don’t get too much of that – mostly Apocalypse’s machinations. And, while it’s cool to see a giant-sized Karkas rampaging in the city, it reminds me that the creators might not have had the best interests of the characters at heart. Why do I say that? Well, for one, the mutated Karkas is green. Now, you could easily say that Apocalypse just changed his color when he altered him. That’s all well and good but, how does it explain his earlier appearance in his regular form … but still miscolored as green? OK. Yeah, that’s just a surface flaw that we can probably blame the colorist for. But, there are other things that bothered me. Like, why are Reject and Karkas living in Lemuria, the city of the Deviants … instead of with the Eternals? And, why are the Eternals setting themselves up as a public team of super-heroes? We’ve already got enough of them in the Marvel Universe … it’s clear that the writers didn’t know how to handle the Eternals mythos, so they reverted to the easiest thing, it seems. Now, that’s not to say it’s all bad. Bringing back Virako was a great way of displaying how much has changed with the Eternals over the years. Just the fact that they allow Karkas and Reject to live among them is a shock to this “old-school” Eternal, who is used to the days when that would never be the case. And, it seems that Ghaur‘s lifeforce has been imbued into a golden statue that now rules over the Deviants. A neat idea but … where’s the Deviants’ previous leader, Kro? This one-shot sets up a new status quo for the Eternals that was thankfully never followed up on. Havok is quickly overcome and is made to do battle with a cadre of Trackers in the arena. As the fight continues, Havok discovers that the Trackers are absorbing the energy from his plasma blasts. He overpowers all of the them, save one who claims to be the only true descendent of the Pharaoh. Havok unleashes a final blast against the last Tracker, a female, now empowered by Havok’s energy and calling herself Plasma – the rightful descendent of the Living Pharaoh! As the riot in the village continues between the “Fathers” and the invading “Comrads”, the Black Panther attends to Theodore Olebogeng, the young boy who has just been badly burned. He attends to the boy and explains to his brother that he will bring him to the nearest hospital. Even though it is a “white hospital” he intends to see that the boy gets treatment. Across a great distance, the battle-wounded Panther carries the boy to his sonar glider. And, after a quick stop to pick up Zanti Chikane, they arrive at the hospital where the Black Panther forces them to attend the boy. Unfortunately, his wounds were too severe – but the Panther makes a profound statement about the doctors there who won’t (or aren’t able) to treat patients because of their skin color. As Coldblood-7 makes his way through the complex, the mystery woman’s voice continues to guide him. Finally, he meets up with her and she reveals that she is the one who performed the cybernetic surgery on him and that his name is Eric. She remarks that his personal memory was intentionally removed but there is a way he can get it back by inputting his personal history data into his internal computer. However, it should be noted that while he’ll then have the facts about his past, he still won’t have any of the emotional attachments to it. At his request, the procedure is done and the woman also removes the internal blocks that kept him outside the wall, last issue. She demands that he leave the complex before Mako finds him there. Coldblood’s computer divulges her name is Gina Dyson as he makes his escape. In a reflective retreat in the oceans of the Moon, Triton finds himself under attack from a moon sea monster! All he wanted was a peaceful trip to get away from all the violence in his life, but he won’t find that today. Especially when this sea creature intends to have him for lunch. The Triton story was pretty bland, although it does suggest that Roxxon Chemical Corp. has performed some wrong-doings on the moon – leading to mutated sea creatures. The Colblood story seems to be moving at a very fast pace – a polar opposite to the Black Panther’s slow build. Don McGregor has written a lot of comics. He’s also written a lot of good comics (an important distinction). Two of his most well-regarded runs were the Killraven features from Amazing Adventures (loosely based on H.G. Wells’ the War of the Worlds) and the Black Panther: Panther’s Rage storyline from Jungle Action. His graphic novel, Sabre: Slow Fade of an Endangered Species was actually published months before Will Eisner’s A Contract With God (which is widely considered “the first graphic novel”) and went on to later become an ongoing series. McGregor also went on to write non-super-hero comics, which was a bold move at the time. 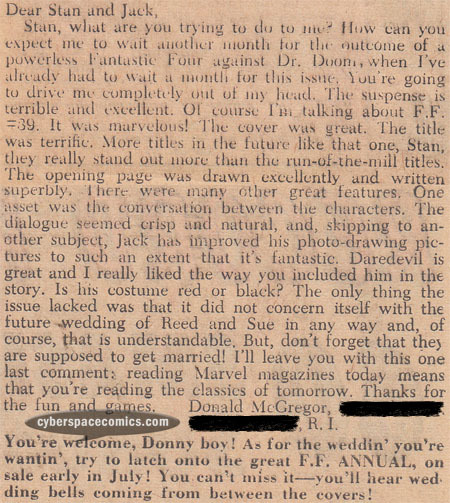 He got a letter published in Fantastic Four #42 (cover date – August 1965). 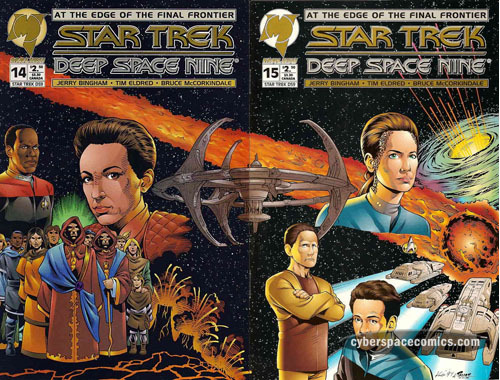 Star Trek: Deep Space Nine issues 14 & 15 united to form one image with Terok Nor dead-center. 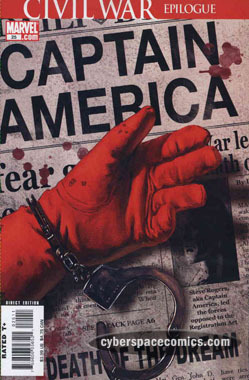 Killing off Captain America was a bold move that could have set the fans against Ed Brubaker’s run. But, it paid off … and he’s back already, anyway. 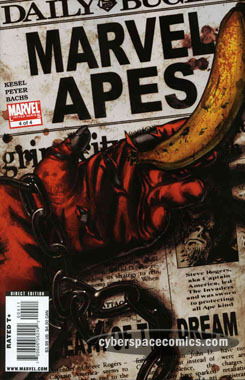 Such a news-making event is certainly a target for parody – take it away, Marvel Apes! This was the first of the Mangaverse specials to not let me down. And, actually, I was rather impressed with it. Kaare Andrews’ character designs fit very well into the Mangaverse and his art is superbly dynamic and fun to look at. His script kept it simple and to the basics of the Spider-Man character. A little Eastern sensibility was added to the Spider-story but, it all pulls together nicely and sets up a greater story to be told. 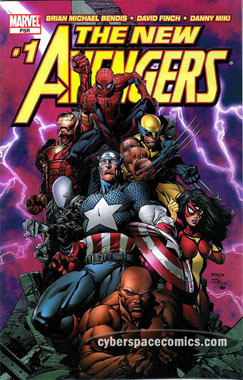 Fortunately, this is the one Mangaverse one-shot that was, indeed, followed up on with a mini series, years later.